The reason I was in the kitchen was I was looking through my Cooking Light magazine. There is a cranberry sauce I am thinking of making for Thanksgiving. Not that anyone in my family will eat it. 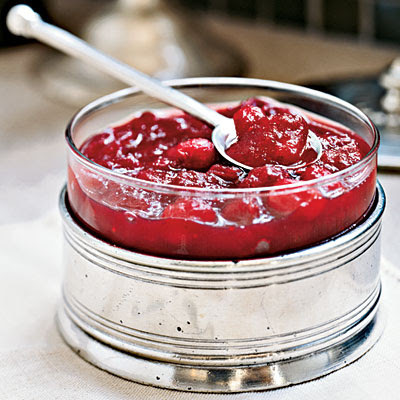 The only kind of cranberry sauce they eat is the canned jellied kind. Just the way I can put out all the Beaujolais and Riesling I want and fine, everyone in my family will still just drink beer. Well, I will eat the homemade cranberry sauce and that is enough for me. So I am thinking of making it. But this recipe, it kills me! It calls for three-quarters of a cup of fresh orange juice. "From three oranges," it says. Excuse me, I am not going to squeeze three oranges into this cranberry sauce. There are some occasions when it is perfectly justifiable to use ready-made orange juice and this is certainly one of them, you know? Unbelievable, these cooking magazines. On the one hand they are always telling you to use canned broth and -- this is the best -- refrigerated potato slices. Which, has anyone ever actually bought those? On the other hand oh, we are not supposed to buy ready-made orange juice, oh no no no. So I am standing there in the kitchen thinking about that. Then I looked up. And I saw the world's oldest fly, on the Venetian blinds! No kidding, this fly is so old that he could not even turn its head and look at me, much less move. I decided to let him live. He is just so old! Every once in a while you run into something like that, a thing that has lived long past its season. Old as Lou Rawls! That is a line my brother George heard once in a rap number and we never forgot it. It was one line that jumped out at him. ... died in 2006. He was born in 1933 which makes him nine years younger than Leonard Pennario. Somehow it seems Lou Rawls was older, though. You never hear a rapper say, "Old as Leonard Pennario!" And I was feeling old for liking Lou Reed and The Velvet Underground! Oh my but I have traveled a long road. Mary, I will tell you what. Since you often manage to make this bachelor hungry what with the yummy looking pictures and associated descriptions, I would be willing to help you eat that cranberry stuff if you send me some. Yep, yep. I'll take some cranberry sauce off hands! 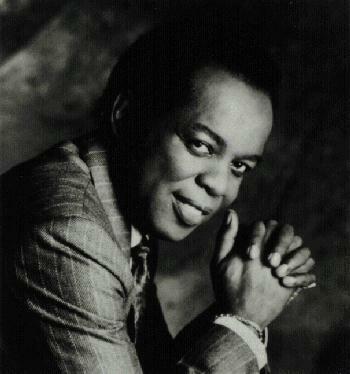 And, of course, Lou Rawls was also a Capitol Records artist about the time Leonard was at Angel.